Este tanque se desarrolló para el ejército checo. Sin embargo, se produjo sobre todo para la Panzerwaffe desde 1939 hasta 1942, con una producción total de 1411 vehículos. Visually, it's not that different than its predecessor, the Pz.Kpfw. 35 (t). It offers increased top speed and mounts a more powerful gun, but sacrifices traverse speed and has 1mm less armor on the sides and rear. This tank was designed as a combat tank, not a scout, so gauge its speed and manoeuvrability accordingly. The traverse speed is vastly inferior to the Pz.Kpfw. 35 (t), though the overall manoeuvrability and handling characteristics are significantly improved. Fortunately, it has the 4,7 cm Pak 38 L/43 gun, which is probably the highlight of this tank. This gun is insanely light at only 100 kg, yet it's no slouch, with good damage, penetration, accuracy, and rate of fire for this tank's tier. It's roughly equivalent to the 700 kg 5 cm KwK 38 L/42, with 10 less damage, but with slightly better penetration and vastly improved accuracy. While the acceleration could be better, once it gets up to speed, it's able to maintain it well. This means the tank can hit targets while running around quite well. Unless you're in the top tier, you should avoid head-on engagements. You don't have the armour for it and it means you won't be mobile, which is your best defence. Typically you'll want to play as a support tank if you're not going for the enemy's artillery or acting as a passive scout. Use hull-down positions whenever possible and remain undetected, as you may find yourself quickly destroyed. Stay on the move, relocate often, especially in tier V battles, so the artillery and hostile guns won't pinpoint your location. The good mobility makes this tank a great flanker. To perform well, exercising caution is important. Pz.Kpfw. 38 (t) has fairly thin armour, but its good gun depression, small size and good camouflage factor help alleviate the problem. The 4,7 cm Pak 38 L/43 gun has a great rate of fire, great penetration and good alpha damage, enabling you to dispatch tier II and III enemies with ease and remain competitive even in tier V battles. Guerilla tactics work very well, use cover, pop out to shoot and minimise exposure to the enemy. 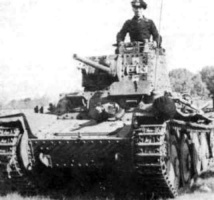 On March 23rd of 1939, CKD (Ceskomoravska Kolben Danek) delivered single LT-38 tanks to the Royal Armored Corps’ Gunnery School at Lulworth for demonstration, with hopes of selling tanks to the RAC. The demonstration was concluded with a report that stated the following: "On the whole, the machine is almost equivalent to our cruiser tanks, but little experience or experiment has gone into the design of the fighting compartment, and performance has been obtained at the expense of the crew and general fight-ability." 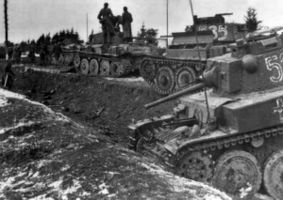 The report largely critized the LT-38 and the RAC did not purchase any tanks from CKD. The 1938/39, German take-over of the Czechoslovakian state led to the confiscation of 150 LT-38s in production in March 1939, and CKD/Praga was ordered to complete them all. All of them were incorporated into the German Army as the PzKpfw 38 (t) Ausf A - Sd.Kfz.140. After the German take-over of Czechoslovakia, the LT-38 became one of the most important tanks used by the Panzertruppe and was retained in production as a tank until June of 1942. During the war, PzKpfw 38 (t)s were exported and saw service with German Allies including: Romania (50), Slovakia (90), Bulgaria (10), and Hungary (102). 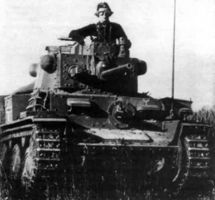 The PzKpfw 38 (t) also saw service with the Allies. 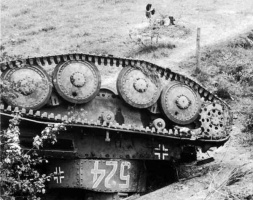 A single tank was captured by the British and French in May / June 1940. Another example (turret number 543) was captured either during the Italian Campaign in 1943 or Normandy in 1944 and was tested in England. Numbers of PzKpfw 38 (t)s were captured and pressed into service by the Red Army. A number of PzKpfw 38 (t)s in service with the Slovak Army participated in the Slovak national uprising in August of 1944. Finally, in May of 1945, the PzKpfw 38 (t), now known as the LT-38/37 (37 standing for 37mm gun,) was back in service with the Czechoslovakian Army as a training tank until the early 1950s. 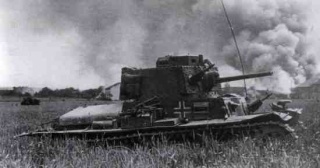 A number were also converted to flamerthrower tanks by replacing the hull machine gun with a flamethrower, while fuel was supplied from a towed single-axle trailer carrying 200 liters of fuel by a hose. 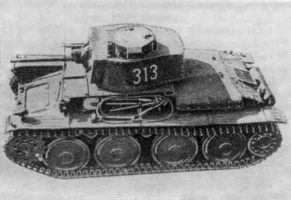 There was also the PzKpfw 38 (t) swimming tank with a prototype AP-1 float, but it never entered production.